It was a rainy day in Amsterdam, 14th September 2010 to be precise. While I had planned to walk down the canals and spend time in the gardens, rains forced me to do otherwise. I decided to make maximum use of my “I Amsterdam” Card and headed to Museum Square. Passing by the gates of Stedelijk Museum which was under renovation, I was piqued by a banner outside which said Exhibition of “Measuring the Universe” by Roman Ondak. 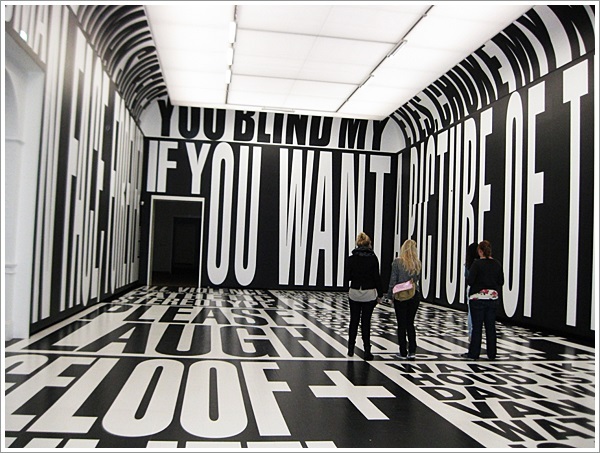 Though, I am not a great fan of Modern Art, still made my way inside following the signs towards the exhibition. It was a huge hall with milky white walls and lines of black scribbles some where in the middle all over which almost appeared like black ants moving in a disciplined file. 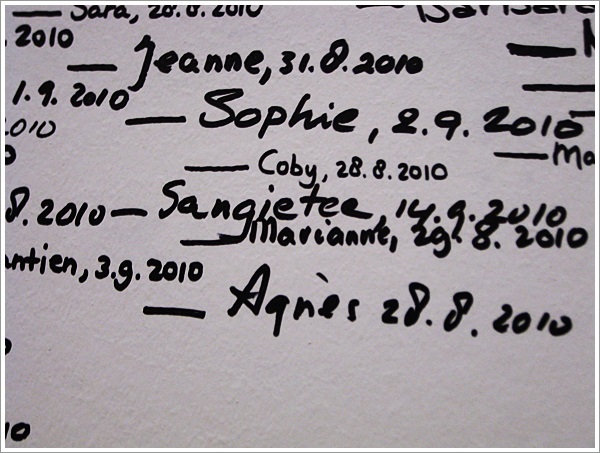 I walked towards a wall and noticed names and dates. My gaze fell on a young Japanese girl who was standing against the wall and a facilitator was scribbling something on the wall against her height. I walked towards them to be told that they were measuring the universe with this technique by recording the details of all the visitors to the museum. Amused by this unique technique, I quickly found a wall to inscribe my name. Influenced by numerology, I was using a different spelling those days “Sangietaa”. As, I was being measured I remembered my father measuring me against the wall during my growing up years and it was almost like a game since I wanted to be taller than him. Speaking to the facilitator, I was enlightened about “Measuring the Universe” being an installation art by Slovakian Artist Roman Ondak. He first did it in the Museum of Modern Art in New York in 2007 and was planning to do it in other cities. It was his aim to allow everyone to be a part of modern art which by popular perception often lacked warmth and appeared to be stoic. Indirectly, it was a coming together of strangers who were bound by a measurement on a given day. Amsterdam had left its indelible impression on me and this measurement was just my way of leaving my mark in the city. I spent some more time in the museum, walking through halls with classy wooden floors until I reached a room which was overwhelmingly black and white and for a moment I lost my awareness of place. Stedelijk Museum was founded in 1874 and was housed in close by Rijks Museum until 1895 AD after which it moved into its current premise. Apart from this form of extreme modern art, the museum also has a grand collection of photographs and paintings. i love museums…i really do….but i am saddened by the declining interest of the commoners in them…. The details of the visit to the city of Amsterdam including that of the measurement of the world through art is unique and amazing. A great post. Thanks Kajal. Am glad you liked it. it is amazing how the experience of a city can be defined by an art exhibition that happened to be there when you went, or a chance meeting, etc. i visited Amsterdam on work in 2009, and the entire city was dotted with sculptures of elephants painted in the most amazing ways…it was Olifant City that time and it left a great impression on me of Amsterdam as an serious ancient city with a fun side! Nice post…. So true. It’s e beautiful city and when I think Amsterdam, this is the first thing that comes to mind.